June 2018! I woke up this morning and put my coffee in a to-go mug like I always do. I hopped in the car with Greg (weird, we've never commuted together before, he takes a carpool to Boulder at 5am - YIKES). We stop at the studio to pick up some white paint and I immediately drop the paint on the asphalt in front of the Art Tools Mural I painted last October. I didn't spill paint there while I worked with High School kids all week, but alas, I did today. I almost always spill paint. At Google, I spilled green right into my handmade in Boulder Maruca Bag (just coated my sunglasses, wallet, spare change, all those business receipts). 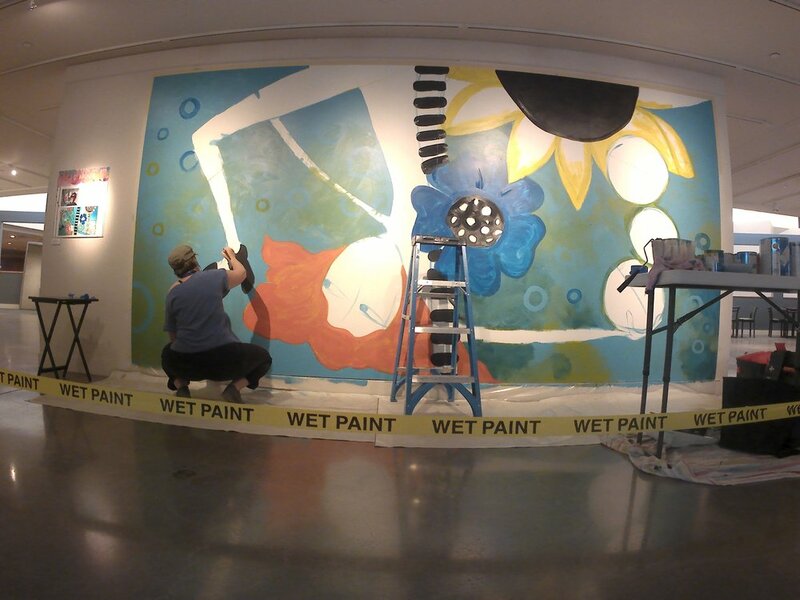 This week I'm painting a 9'x16' mural at The Arvada Center. I'm painting about prescription pain medication addiction and overdose while hundreds of small children are coming and going to their summer camps. Questions from the little kids "why does she have so many vitamins?" and "My Mom is a school teacher!" (is that a question?) and "WOW! THAT WAS WHITE WHEN I GOT HERE THIS MORNING!" I love them, they are hilarious. One boy said "I see bubbles, but that girl is drowning." I feel my concept has been received. COME SEE ARTISTS WORKING - May 29-June 24 Monday thru Friday 9am-6pm, Saturday 10am-6pm and Sunday 1pm-5pm or come see a show! SPECIAL THANKS TO SHERWIN WILLIAMS FOR ALL THE PAINT COLORS! Thank you all so much for you generosity! We were able to raise $300 in one day!!!! I'm amazed and humbled and I so appreciate your willingness to do something right now about this serious emergency overseas. Children should not be raised in this kind of brutality. I hope that Unicef can send the funds where it's most desperately needed. I hope we can do more... but for now, Thank you! Enjoy your ornaments & I hope whenever you unpack them and put them on your tree you remember the good you've done for kids. I am doing an ornament fundraiser for the children of Aleppo & the angels who are trying desperately to evacuate them to safer places. This is an emergency & no child should ever see what these kids are seeing. Heartbreaking. Donate directly to Unicef or White Helmets (The White Helmets pull people out of rubble, people buried alive). Stop everything and give anything. Buy an ornament and I will donate 100%! Half of you have been begging me to do this for a long time and the other half are asking me "what in the world is an adult coloring book?" Am I publishing adult content? Is this something we should be talking about publicly? So what is an adult coloring book? It's a few things. It's permission for adults to color without having to gag on some Disney princess while you do it. It's a recommended stress relief technique that has proven very successful for many people. Ask around, everyone is coloring! When the doctor asks stressed out adults "what do you do for self care?" You can get an expensive mani-pedi, or you can salt scrub exfoliate with Aveda products, but none of these things can be done in less than 20 minutes in a coffee shop on your lunch break. Self care needs to be a habit & it seems coloring is catching on like Elsa & Olaf at Halloween (only waaaaaay different). Adult coloring books are as much about stress relief as they are about content. Some coloring books are challenging and intricate and kids would cry if they got hold of one. Adults too, in my opinion. Repetitive mathematical shape stacks are no fun. I'm sorry Aztec pattern lovers, you will not find this sort of thing here. So, what I've tried to do is eliminate math totally from my work and my life. I find that very helpful. I draw whimsical scenarios and some are quite complicated. I prefer a group of average ladies standing by the pool waiting for something (who knows what?) looking in all directions with swirly waves that a person could literally color fifty shades of teal. If you've followed me for a long time you know that I love to draw every day. Unfortunately, I also love to color my own drawings (gouache is my preferred medium)... so when I was asked to make coloring books, I looked into my 17 years worth of sketch books and not one drawing was print ready. So I began the purposeful task of recreating 40 drawings in the proper format. I'm already working on the next 40 drawings... so don't worry, if you power through these Zines, more are on the way! I hope you enjoy them as much as I enjoyed making them. Please visit "New Work" for Zines available now. If you wish to buy 40 or more, please email me about wholesale pricing! High School for me (and most other people, I realize) was a tough time. I was a minority (yes, I'm white), I was naive, my school was undergoing historic strife including teacher strikes, gunman on campus (that was my locker partner), drug busts, gang violence, and if that wasn't enough, East Colfax where my school was situated was routinely closed in an effort to prove that prostitution wasn't the highest paying job available to women. So, one of the highlights of those four years was my Mom's hairdresser. He moonlighted as a special effects make-up artist. One day he called me to do the weirdest thing I've ever done. I was to join him for a polo match where we were the official "face painters" for the Make-a-Wish Foundation. I made a wish that day (as wishes were on my mind as we raised thousands of dollars for kids who needed more than one wish). It was very selfish. I was a teenager! I wanted life to take me away from poverty, violence, and frustration and deliver me into more opportunities like this one. I felt like the luckiest kid alive that day. I was trusted. I was talented. Prince Charles was there. Money was flowing like a chocolate fountain at a champagne brunch! Possibility was present. My wish came true. I find myself in the strangest most exhilarating scenarios often, but there's still this pull to give others the perspective that Shamus (the hairdresser) gave me that day. To let others see that you can be trusted, talented, and entertained by your job & you can be rewarded. This is why I teach. Lapidary Journal gave me an opportunity to teach what I do best (make silver boxes) and let me explore wish-making at the same time. It's a very simple beginner project... but it came from the heart. The top of the box is open, so you can write your wish on a piece of paper and tuck it in. What would you wish for? Click on the picture above to follow the link to the video downloads. There are six other J.C. Milner projects and hundreds of other videos to download. If you aren't interested in making it yourself, I would be more than happy to make it for you! A new perspective is priceless and wishes DO come true! Thank you, to everyone who has called me the night before Mother's Day or on the eve of a loved one's birthday and asked me to send photos of my new work! 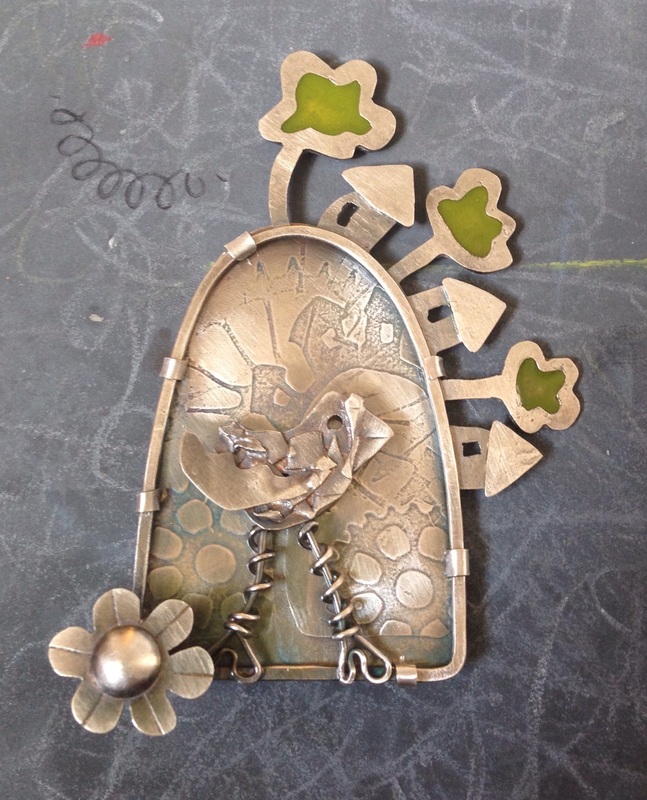 Thank you for being patient with me and meeting me all over the place to collect your hand-made J.C. Milner Metalworks art jewelry. This method of purchase, exhilarating as it is... is now easier, AND everyone can purchase items hot off the press from anywhere in the world! I can upload new work right from my bench to this new site & you can trust that your information is safe with me! I hope you like this new online store. I will update often and if you find yourself gift-less the day before Valentine's Day, please know that I haven't dismissed the old method of coming through for my people at 10PM in the grocery store parking lot! I still love the adventure of it all and I love seeing the expression on the face of a person who loves my work! It's really the best. When you purchase here, feel free to email me with comments (and selfies) when you get your items! I will look forward to this new change and I hope you will visit often!